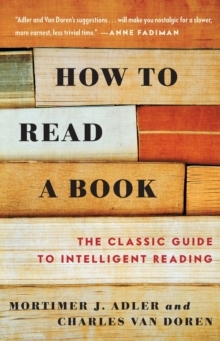 With half a million copies in print, How to Read a Book is the best and most successful guide to reading comprehension for the general reader, completely rewritten and updated with new material. Originally published in 1940, this book is a rare phenomenon, a living classic that introduces and elucidates the various levels of reading and how to achieve them-from elementary reading, through systematic skimming and inspectional reading, to speed reading. Readers will learn when and how to "judge a book by its cover," and also how to X-ray it, read critically, and extract the author's message from the text. Also included is instruction in the different techniques that work best for reading particular genres, such as practical books, imaginative literature, plays, poetry, history, science and mathematics, philosophy and social science works. Finally, the authors offer a recommended reading list and supply reading tests you can use measure your own progress in reading skills, comprehension, and speed.